Fast food workers staged protests in the Bay Area and around the county Tuesday to demand pay of at least $15 an hour. And they have pledged not to vote for presidential candidates that don't support them. SAN FRANCISCO (KGO) -- Across the country, workers are coming out to demand higher wages. Healthcare workers in California have collected 500,000 signatures to raise the minimum wage to $15 by 2021. In San Francisco and Oakland, employees protested for higher wages at fast-food restaurants on Tuesday. Protests like this are happening in 270 cities across the U.S. to kickoff the year-long Fight For $15 campaign before the next election. On their website, the group states: "We work for corporations that are making tremendous profits, but do not pay employees enough to support our families and to cover basic needs like food, health care, rent and transportation. These are billion-dollar companies that can afford to pay their employees better. Low-wage jobs are the fastest growing jobs in the nation, and they need to pay more so that workers like us can make ends meet, and rebuild the middle class and get the economy working again." They're asking that companies like McDonald's and other employers pay their employees a minimum wage of $15 per hour instead of the current $12.25. They also want to unionize. 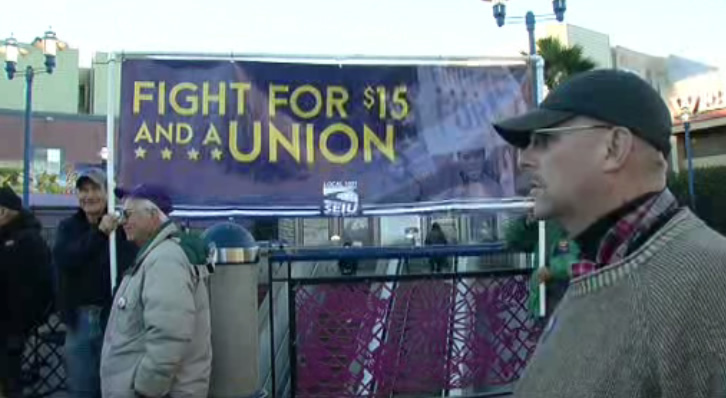 San Francisco workers are taking part in the Fight for $15 campaign, which kicked off on Tuesday, November 10, 2015. "I am here to Fight for 15 because I want to be able to help my mom pay bills, I want to be able to pay my phone bill," one woman said. Several bay area cities are moving toward $15 per hour, but not immediately. On January 1, the minimum wage in Berkeley will be $11, $12.55 in Oakland, $12.25 in San Francisco and $10.30 in San Jose. "Our labor commission says we could go to $19 an hour," Berkeley Mayor Tom Bates said. In Berkeley, the plan is to go up to $12.53 by October 2016. What happens after that will be up to the city council. "Berkeley would like to be smart. We would like to do something that would help our people give them more money, but at the same time not kill the goose that lays the golden egg, which are all of our restaurants and all our small businesses," Bates said. "I feel like the chamber's job has been to help people find a balance, between everybody deserves a fair wage and we don't want Berkeley to become a city with no local businesses," Berkeley Chamber of Commerce spokesperson Polly Armstrong said. Organizers say this goes beyond fast food restaurant employees. "This is for all low wage workers, such as daycare providers, health care, adjunct professors. They are all included because they are all living below the poverty level," said Maria Zarate, one of the protesters. She's feeling confident that this movement will create change. California voters may get their chance to weigh in if a statewide measure to raise the minimum wage to $15 by 2020 qualifies for next November's ballot.